Black Bean Tamale Pie! This weeknight meal is healthy and filling! Black Bean and Zucchini Chili topped with homemade cornbread. Baked to perfection! Vegan with Gluten-Free option. 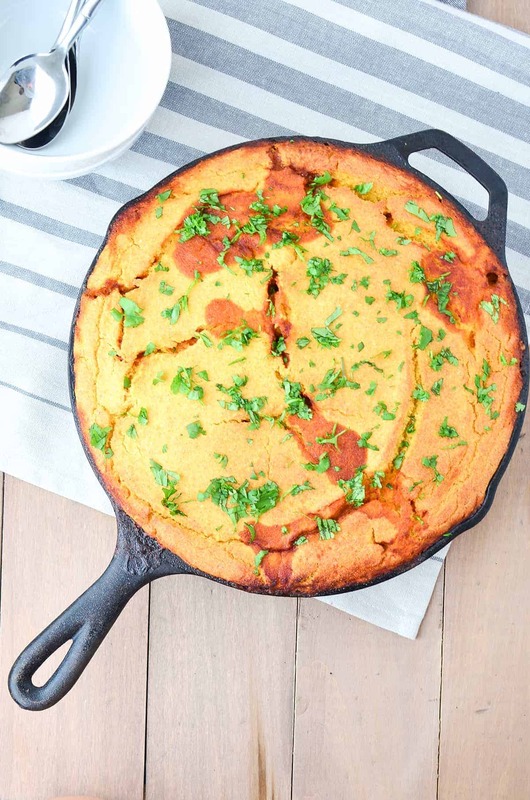 I’m fairly certain that I will love any recipe that includes the words ‘cornbread crust’ in the description, but this tamale pie might just take the cake. All the flavor of vegetarian tamales with a fraction of the work. I was first introduced to tamales at one of my first jobs in California. Authentic Mexican food was still new to me; Richmond, VA wasn’t exactly a hot spot for taquerias and burrito joints. My experience with Mexican food was relegated to ChiChis and Chipotle. And then I moved to California and the rest was history. You all know how this story is going to end. You know my weakness for all things flavor and spice. If it’s got heat, a sauce, and carbs, I’m down. Tamales though, were a new adventure. My co-worker brought them to work for a special potluck event, and I must have asked a zillion questions on how she prepared them so I could run home to try and recreate them in my own kitchen. And I did, once. After hours of work and then failing to wrap them the precise way that’s required my experiment was over. Fail. Tamale pie? Easy as pie (pun intended). All the flavor, none of the work. Tamales, I still love you, but unless someone is making them for me, I intend only to eat you in pie form. For this month’s “pie” Recipe Redux challenge, I wanted to create something savory and unexpected. The bottom layer is a simple black bean chili that comes together in just 15 minutes. Chop an onion, add in zucchini, bell pepper, garlic and spices, and stir in a can of diced tomatoes and black beans. Just like regular chili, you can season until your heart’s content. I use the usual suspects: chili powder, cayenne, cumin and coriander but feel free to turn up the heat with chopped jalapenos or other spices. Then comes the best part- the cornbread crust. 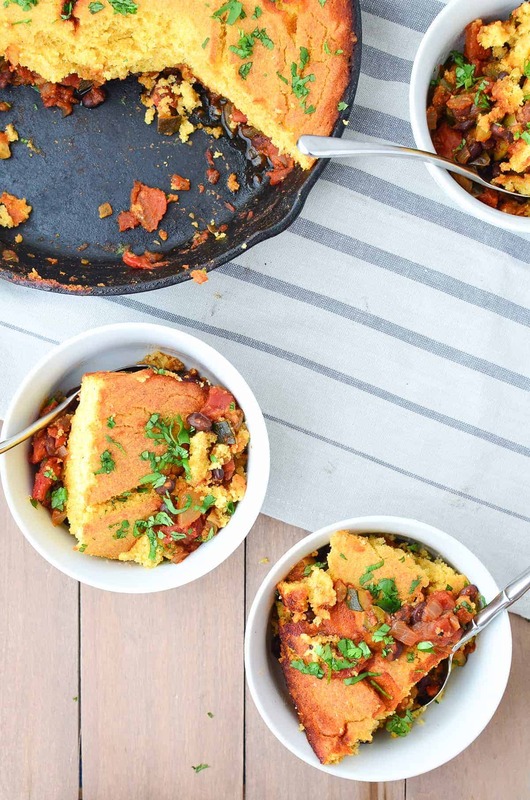 Essentially, tamale pie is just chili and cornbread combined together in one pan. And for me, it’s not chili unless I’ve got a side of cornbread. I’m using my favorite cornbread recipe here that’s only 7 ingredients and requires just one bowl. While the chili is cooking, mix up the cornbread and set aside. Did I mention how much I love dinners that only require one bowl and one skillet? Considering it took me hours to clean up after my one tamale episode, this was a welcome change. Pie goes in the oven, delicious dinner comes out. If you decide to use a casserole pan for this instead of a oven-safe skillet, make sure your chili is fairly saucy. It will dry out as it cooks in the oven and you want enough moisture to create the best part of this meal —> the thin layer of soggy cornbread that’s been baked in chili juice. The top layer is slightly crunchy, the underneath is perfectly soggy. The texture is so perfect. 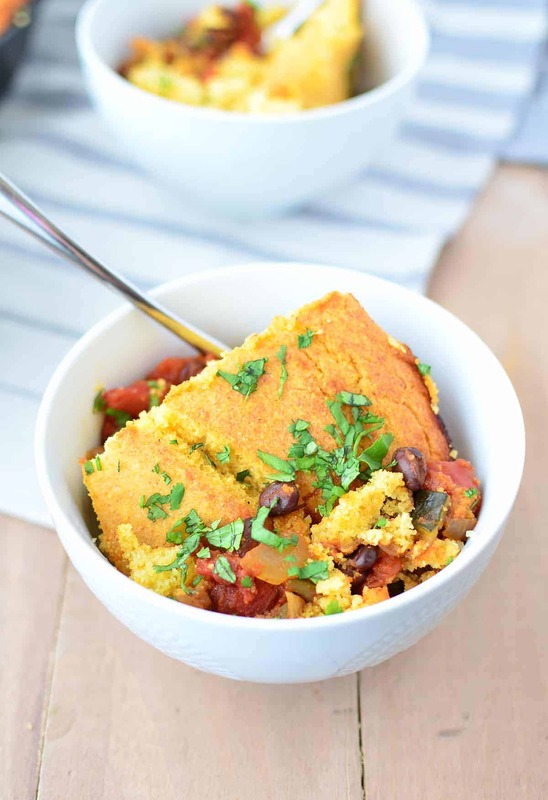 Good luck not picking off the cornbread topping as you dish this one up! Ready for more pie recipes? Enjoy the Recipe Redux round up below featuring healthy, pie-inspired meals! Heat a 17 inch cast iron skillet (see notes for different sizes) over medium heat. Add the olive oil and saute the onion for 3-4 minutes until translucent. Add a pinch of salt and the garlic, stir together. Add the rest of the vegetables- bell pepper and zucchini along with the chili powder, cayenne pepper, cumin, and coriander. Cook until soft, about 10 minutes. Preheat oven to 400 degrees F. Whisk together the cornmeal, flour, baking powder, canola oil, maple syrup, milk and apple cider vinegar. Set aside. Add the black beans and tomatoes with juice to the skillet. Pour the cornmeal batter over the filling and bake for 20-25 minutes until golden brown. I used a large (17 inch) cast iron skillet for this dish but if you don’t have a skillet that large, use a casserole dish instead. Make the filling and pour into a casserole dish, cover with cornbread mixture and bake as directed.Feel free to get crazy with variations! Add in chopped jalapenos, shredded cheddar cheese, or thawed corn kernels to your cornbread topping. Once it’s baked, enjoy as is or top like you would your favorite chili! What a fun and easy way to eat tamales! I also prefer to eat tamales made by someone else, hahaha! Delish! This is my kinda “pie”! Never have to much southwest/mexican inspired food! Anything with cornbread = amazing. I am trying to eat up my pantry and keep finding more and more cans of tomatoes (what the heck…) so I just pinned this to hopefully make for dinner next week!! This is on next weeks menu! Do you think I can use oat flour and sub applesauce for the oil? This was really really good. I ate 2 servings! I used a corn muffin mix with your list of wet ingredients and it turned out perfectly. This was so easy to make and satisfied my tamale craving. Great creation! So glad you liked it! Thanks Christian!